Tower Manufacturing’s GFCI Adapters offer OSHA required electrical safety for use with temporary electrical power. 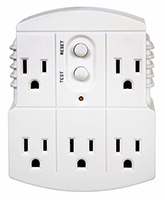 GFCI Adapters add shock protection to standard 15 Amp outlets. They are designed for indoor use only and are ideal safety solution for office breakrooms, workshops, labs, garages and homes. They are small enough to carry in your tool box and offer 1 to 5 GFCI protected outlets. All Tower’s GFCI Adapters are designed to automatically reset to “on” position upon being plugged in or after a power interruption. All automatic reset GFCI’s must be manually reset after a ground fault occurrence.